Our Evostar 102mm (4") f/9.8 refractor telescope is a high-quality refracting telescope, perfect for the serious amateur astronomer. The Sky-watcher EVOSTAR series are two-element, air-spaced, multi-coated objective achromatic refractors. They are truly outstanding, high-performance, high-resolution instruments manufactured to extremely high standards of optical and mechanical precision. With their long focal lengths and breathtaking, diffraction limited optical performance, they are ideal for the detailed high-power study of the Moon, Planetary Surfaces and other objects in our solar system, giving crisp contrasty images. 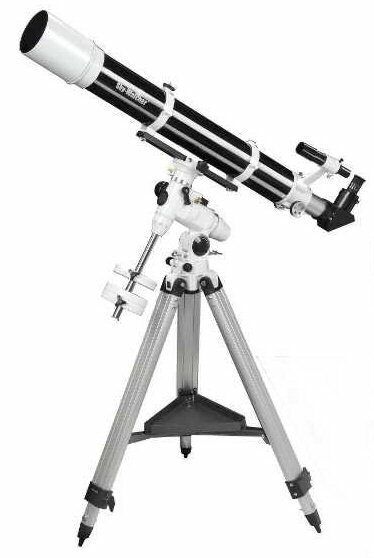 Our Evostar 102 telescope is manufactured by Sky-Watcher, one of the most respected telescope manufacturers - products you can trust, representing great value for money. Supplied with Sky Watcher's sturdy EQ3-2 equatorial tripod mount.